According to Prime Minister Lee Hsien Loong, home, heart and hope are key themes that will determine Singapore’s progress over the next two decades. Singapore, albeit small, cannot be small-minded and has to become a home that all Singaporeans love and an inclusive society with heart. The message was delivered in front of 1,500 people at the National Day Rally last Sunday. “Most of us understand the need of immigrants and foreign workers, and as such we must show a generosity of spirit to one another, including new arrivals,” Mr. Lee added while being highly critical of the xenophobic sentiments aired by a vocal minority in recent times. He stressed that in a globalized world, Singapore must remain an open and confident society and continue to welcome those who aid to the city-state’s growth story. Singapore Company Registration specialist Rikvin supports the view and is optimistic that the message will set the tone for business regulations to come, and most of all, resonate with new Singapore residents and citizens who are wary of the xenophobic overtones of immigration debates in the blogosphere. Analysis by Rikvin shows that Singapore’s economy has grown by 1.7% in H1 2012, putting the city-state on track to hit 1.5% – 2.5% growth for the year. Additionally, Singapore’s standing remains high vis-a-vis emerging countries like India and China or advanced nations like the US. On the home ground, PM Lee announced new investments or measures in education, public housing, transportation and healthcare in a bid to ensure the competitiveness and relevance of Singapore’s economy over the next two decades. Additionally, the Singapore government is working to reverse Singapore’s declining fertility rates, plug manpower gaps in certain industries, as well as reduce reliance on basic-skilled foreign workers, which has depressed local wages. “We are optimistic that the outlook and measures in the pipeline will cool the pain points that have become the core of anti-foreigner dialogue among some citizens. On another note, PM Lee’s message is clear – firstly, that Singaporeans must continue to up its game amid growing competition worldwide and secondly, that Singapore must continue to remain an open economy and allow high-calibre individuals to enhance the economic pie for all in Singapore, Mr. Satish Bakhda, Head of Rikvin Operations. Rikvin’s analysis shows that the city-state remains as the preferred city for gold-collar professionals in Asia. A case in point is the high-flying geopolitical strategist Dr. Parag Khanna, who moved to Singapore early this year. Dr. Khanna who heads the Hybrid Reality Institute, a global network for strategic thinking on digital future, had in an recent article in the Straits Times described Singapore as “the world’s leading info-state,” “the capital of Asia” and a living lab unlike no other. “The Singapore government has played its part in attracting several high-skilled professionals such as Mr. Khanna to Singapore via favorable immigration policies. The most notable of which is the the Singapore PEP (Personalized employment pass) framework, which is independent of any employer, and issued to individuals based on their own merits, for five years. Our recent career talk at the Nanyang Business School has also affirmed that MBA students are interested in this unique employment pass,” noted Mr. Bakhda. 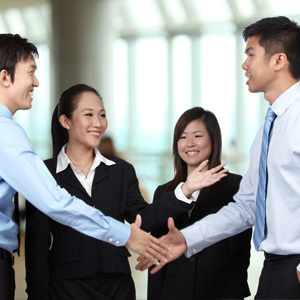 “There are multiple options and benefits for gold-collar professionals who wish to relocate to Singapore. Whether by employment or via Singapore company setup, gold-collar executives can enjoy attractive personal tax and corporate tax rates as well as incentives. The city’s sophisticated infrastructure, clean environment and array of world-class education and recreation options also earn it a reputation as an ideal place to live and raise a family,” concluded Mr. Bakhda.